In social networking circles, a low LinkedIn member ID number gives you digital street cred. Because LinkedIn numbers its users sequentially, the lower your member number, the longer you’ve called LinkedIn your business networking home. What does a low member number mean? A super-Iow LinkedIn member number — within the first 2.5% of total current members — suggests you are an innovator. Innovators are risk takers or risk tolerant. A low LinkedIn member number — from 2.5% to 13.5% of current members — makes you an early adopter and, possibly, an opinion leader. Early adopters often command attention and respect. They spread new ideas from innovators to the rest of the population. In other words, the early adopters of LinkedIn helped it to scale. To determine how you stack up, you first need to locate your member number. LinkedIn does not make it easy. Over the years, LinkedIn has moved where it displays your member number around — so much so it resembles a kind of shell game. Only now, when you peer under each shell, your member number is nowhere to be found on the visible page. 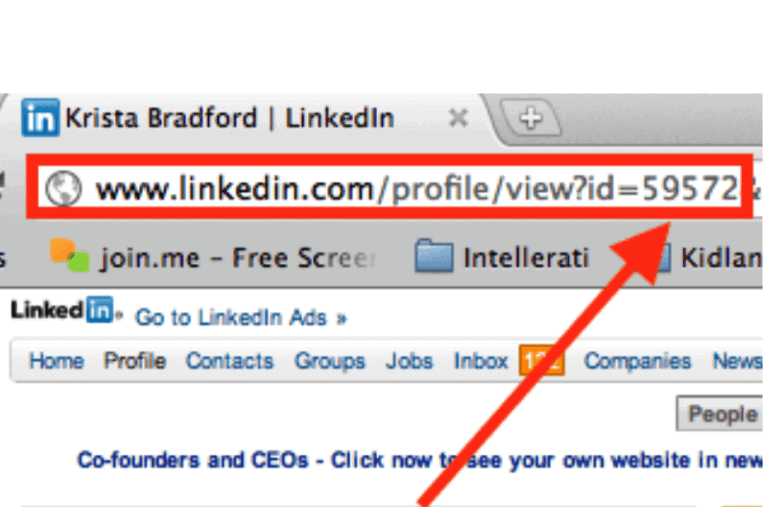 My personalized LinkedIn profile ID is http://www.linkedin.com/in/kristabradford. However, that’s just my public profile web address. Five years ago, when I clicked on the button “View Full Profile”, I used to be taken to a page that had my member number in the URL. My member number used to be visible in the web address of my profile page after “http://www.linkedin.com/profile/view?id=” as shown in the screenshot below. But no more. 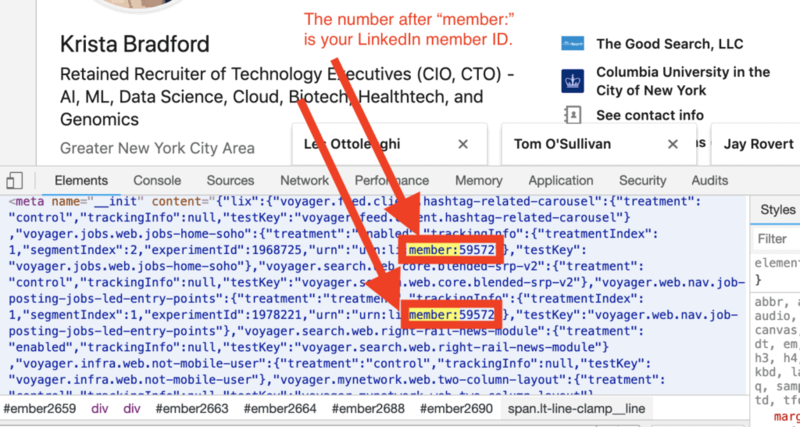 Instead, LinkedIn has moved member numbers into the very code for the page. Here’s how you find your User ID member number in Google Chrome. Next, you want to search the code in the “Inspect” window. Type Control+F in Windows or Command+F on a Mac to open the “Find” function. The number after “member:” is your LinkedIn Member number. It is a little easier to find the exact date that you joined LinkedIn. In the “Settings & Privacy” window, your start date is displayed after the words “Member since”. My member number is 59572. In other words, I was the 59,572nd member to sign up for LinkedIn. I joined LinkedIn on Dec. 10, 2003. For context, the company was founded on Dec. 28, 2002. As of 2019, LinkedIn claims to have 500 million total users. 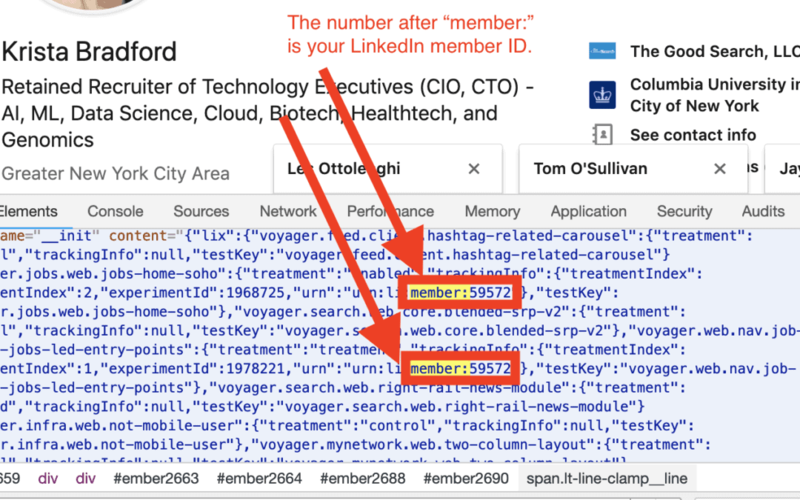 So, what does your LinkedIn member number mean? If your number isn’t that low, that’s perfectly okay. If you are in your twenties or early thirties, you were too young to care about business networking when LinkedIn was founded in 2002. You hold the power to shape the future for LinkedIn. You may not have been an early adopter of LinkedIn, but I would suspect you were an early adopter of Facebook, Snapchat, or Instagram. If you were old enough for business networking but came late to the LinkedIn party — that also is okay. Arriving late and leaving early to a party is often seen as the essence of cool. You may be more rooted in the physical world, and those personal face-to-face connections tend to be more lasting and less disposable than virtual friends and connections. If you were an early adopter, welcome. You likely enjoy experimenting, innovating, and sharing cool discoveries with your friends and colleagues. What is your LinkedIn Member Number and Start Date? It would be interesting to learn the member numbers of other readers to see how low we can go. I invite you to share your LinkedIn member number and start date in comments below. If you’d like, I also welcome insights on your LinkedIn journey to date. Our social network experience changes as the social media landscape shapeshifts. Krista Bradford: Dec. 10, 2003; LinkedIn Member ID 59572. LinkedIn was fun in the beginning. Those of us in the recruiting industry invited candidates to join LinkedIn, and so we helped grow the network, particularly in its early days. After LinkedIn started monetizing its network with recruiting services, they started slapping recruiters around. There were a few times I tried to log in and couldn’t because they’d shut me out. They didn’t say why exactly they shut me out; they just did. They did not disclose their rules, their rule changes, or give users ways to monitor our own usage to ensure we didn’t get bounced. In addition, they big-footed promising recruiting startups and unified address book apps, cutting them off from LinkedIn API. Check out the Electronic Freedom Foundation’s commentary on one such lawsuit by HiQ against LinkedIn. 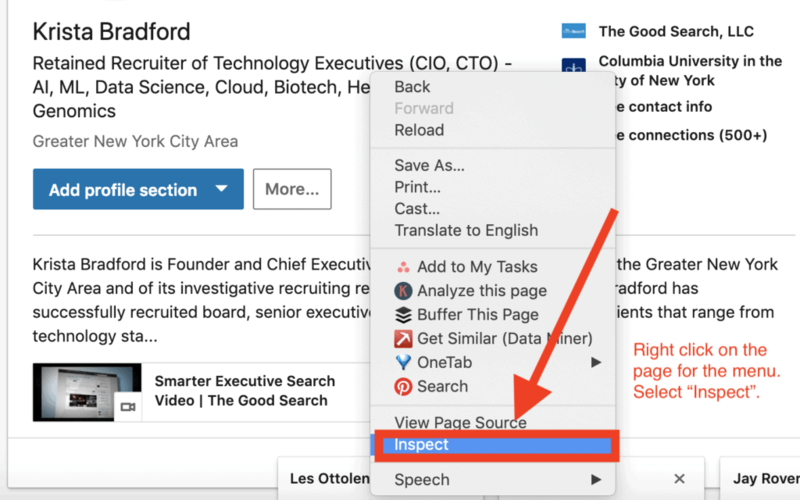 LinkedIn’s latest move has been to restrict the export of 1st-degree contact information from Contacts who have chosen to share that very information. Their claim that the restriction is designed to protect user information makes no sense. Users can simply restrict access to contact information in their settings. Rather, the restriction seems more designed to force users to use LinkedIn to communicate.